Cathair Friel opened the scoring for Ballymena at The Oval. David Jeffrey’s Ballymena United are closing in on a top six slot in the Danske Bank Premiership table. Wonder goals from Cathair Friel and Kofi Balmer earned the Sky Blues three crucial points against Glentoran at the Oval. They now must beat Ballinamallard United at the Showgrounds on Monday night to seal the deal and dump Glentoran into the bottom six. Although Curtis Allen’s goal wiped out Friel’s opener, the Glens never looked like getting the point they required to guarantee a place among the big boys. It was left to Balmer to settle it with a goal fit to win any game. And, it got worst for the Glens as defender Willie Garrett was dismissed after speaking out of turn to the assistant referee. 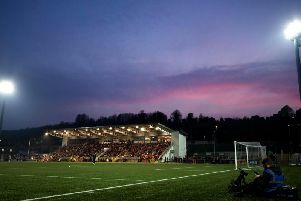 Glens goalkeeper Elliott Morris produced a stunning save after only six minutes to prevent United from forging into a lead. Joe McKinney was first to react when Tony Kane’s cross was flicked on by Kevin Braniff, but the midfielder’s close range volley was brushed to safety. It was the visitors who asked all the early questions. Midfielder Stephen McCullough tried his luck from distance, that caught Morris napping, but he still managed to get a glove to the 35-yard effort. But United were in front from McCullough’s resulting corner kick that fell to Friel on the edge of the box on 14 minutes and his delicious volley arrowed into the top corner, leaving Morris totally beaten. Glentoran responded with Allen’s close-range shot on the turn rapping the post with the rebound smashing against goalkeeper Ross Glendinning, with the ball rolling out. The second half developed into a non event until Braniff tried his luck with a rasping 25-yard drive that whistled just past the post. But the Glens were back on terms on 67 minutes, when Glendinning came to collect a cross from Ross Redman, but the ball spilled from his grasp, leaving Allen with a tap in. United came storming back to regain the lead with 14 minutes left. Defender Balmer surged forward to pick up a McKinney knock down and his blistering drive ballooned the net before Morris could even move. GLENTORAN: Morris, Kerr, Kane (Birney 65), Redman, Allen, McGuigan, Gordon, Davidson (Kelly 80), McDaid (McMahon 36), Addis, Garrett. Unused subs: O’Hanlon, Nelson. BALLYMENA UNITED: Glendinning, Ervin, Balmer, Flynn, McCullough, McKinney (Owens 80) McCaffery (Millar 61), Kane, Quigley, Braniff (Shevlin 65), Friel. Unused subs: McDermott, Faulkner.